Tag is directed by Jeff Tomsic and is the story of five grown men who dedicate the entire month of May every year to playing the same game of Tag that they’ve played for the the past twenty-three years. This is based on a true story. Believe it or not, in 1990 a group of ten kids (the movie is reduced to five) began playing a game of Tag. The game went on for years, including official rules being made and causing the players to get more and more creative in trying to tag one another. It ultimately ended after high school for a few years before it was resurrected into a yearly challenge to keep this tight-knit group together doing something fun every year. After several more years of playing (twenty-three at the time), it became a headline in the Wall Street Journal in 2013, which is what inspired the film. Truthfully, it’s actually kind of inspiring to imagine the bond and the amount of fun these men have likely had over decades playing the same game and staying so close to one another, yet all of them living across the country. 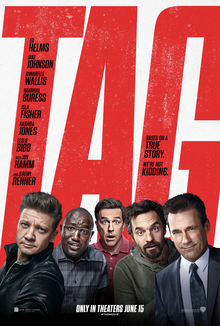 The ensemble in the film consists of Hogan (Ed Helms), Callahan (Jon Hamm), Chilli (Jake Johnson), and Sable (Hannibal Buress) as they team up to try and tag the elusive Jerry (Jeremy Renner) who’s, in fact, never been tagged before and has announced that this would be his last year playing. That’s pretty much the basic plot in a nutshell, but that’s not to say that there isn’t quite a bit of fun to be had throughout the film’s 90 minute run time. I think the film probably does a good job capturing this tale. The characters in the film aren’t actually based on any single one of the real players, but some of the events in the movie are accurate recreations of some of the creative ways the players have been tagged throughout the years. I think knowing this adds an additional layer of comedy to the already humorous scenes. Some of those scenes are sadly spoiled by the trailers, but the film still showcases some fresh tags (or attempts, even) that will surely have the viewer laughing out loud. The performances were pretty spot-on for what you’d expect from the comedic cast. Everyone gets ample time to deliver some great lines, with Burress probably having the most memorable of them. Isla Fisher was a surprise delight as the Anna, the super competitive wife and partner in crime to Helms’ Hogan. I also found Jeremy Renner to be a lot of fun as the incredibly elusive Jerry. Almost every scene with him included a fun action sequence and a clever inner-dialogue as he deduced ways to avoid what might appear to be an all but inevitable tag. The biggest issue people may take away from this film is the lengths some may go through to avoid the tag. In a pivotal scene nearing the end of the second act, the writers stoop as low to have a character possibly fake a miscarriage. I’m not sure how this wasn’t written out of the film, but the purpose of it is for our characters to question the morality of the game and whether or not the ones behind it are actually faking it or not. I just found it in poor taste, and couldn’t kick it at the end of the film. Perhaps the biggest mistake the movie makes, however, is including footage from the real players during the end credits. Not because they’re not funny (they might have provided the biggest laughs of the film, actually) – but because I left the theater kind of wishing that they had just made a documentary on such an interesting group of gentlemen playing a thirty plus year game of Tag.